My friend, Hemi, over at Fooducate gave me this post for Snack-Girl readers. He provides GREAT practical advice for buying healthy food at the supermarket. A fascinating article, "Artificially Sweetened Beverages Cause for Concern" recently published in the Journal of the American Medical Association (JAMA), challenges the notion that artificial sweeteners are risk free. 1.Our body gets confused by artificial sweeteners – the dissociation between sweet taste and calorie intake may put the regulatory system that controls hunger and body weight out of sync, thus sabotaging weight loss plans. A study on rodents showed that those fed saccharin actually gained weight compared to rodents fed sucrose. 2. We’re “Infantilizing” our taste sense – Artificial sweeteners are a hundredfold sweeter than sucrose (table sugar). By getting ourselves used to so much sweet, normal sweet flavors, of fruit for example, become bland and so do other healthful foods such as grains and vegetables, thus reducing our willingness to consume them and ultimately the quality of our diet. If trends in consumption continue, the nation will, in effect, have embarked on a massive, uncontrolled, and inadvertent public health experiment. Although many synthetic chemicals have been added to the food supply in recent years, artificial sweeteners in beverages stand out in their ability to interact with evolutionarily ancient sensorineural pathways at remarkably high affinity. Whether sweetened with sugar, or artificially, our body does not need anything but water. And while switching overnight from a life sin H2O seems impossible, you can opt for baby steps such as watering down juice, consuming soda only during predefined meals / weekly activities, and getting your sweet tooth filled with juicy fruits such as oranges, melons, pears, and apples. If money is your motivator – think about the $500 a year a family of four can save by just switching to tap water. Do you drink diet soda? Please share your thoughts here. OK~ I'm still drinking my Diet Coke, my weakness. But, these are excellent points to toss int he back of my mind! Nice post! I gave up all sodas for Lent this year and I plan on giving them up for good once Lent is over. I had some trouble initially giving them up but now I don't miss them at all. I have been drinking iced tea instead. Thanks for posting this Snackgirl. I don't drink much diet soda, but do put Splenda in my coffee (use about 3 packets/day). I have been hearing a lot about Truvia/Stevia...(not sure on spellings). What is your take? Splenda was supposed to be made from sugar, now I hear it is bad for you. Is Truvia any better? My thoughts are that more sugar (in whatever form) skews your tastes toward sweeter. 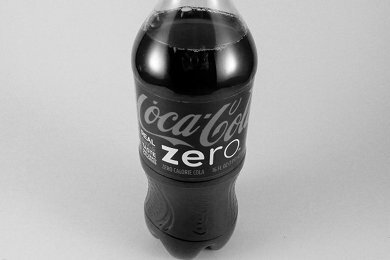 For example, after drinking this Coke Zero - a sweet strawberry tastes sour. You want to be able to enjoy natural sweetness in carrots, etc. - and this stuff is SO sweet that it ruins your ability to taste NATURAL sweetness. Make sense? Great start here about Diet Coke or diet anything. Artificial sweeteners are simply no good. Natural sweeteners like Truvia/Stevia and Agave Syrup are much healthier. Not only that, but pop actually slows down the absorption of important vitamins that you get from food or other sources. So while you're eating that spinach salad with your diet pop, you aren't getting the nutritional benefits of the vegetables that you think! Stick to purified water...add some lemon or lime to it! Green tea is loaded with antioxidants. Your body is craving fresh...not manufactured! My husband has found a direct relation between drinking Diet soda and having some stomach problems lately. When he does bring tea to work instead of diet soda, he never has any stomach problems, but then add the artificial sweeteners into play, and he's having problems all day. We've been trying to cut it out of our diet and stick with teas or flavored waters. We love the Lipton Diet Teas!!! No calories and no extra artificial sweeteners in them and still can handle the sweet craving! very interesting, I had no idea about all these facts...and yes, it is my little evil secret as well....hmm, that diet coke. I do love the diet ice teas, but find that I drink TOO much tea. thanks snack girl for another good one! I agree. I think this can also be said of salt. I don't drink much soda. In fact I have cut down to maybe one a month. I am ready to not drink it at all. However, my problem is I am a tea drinker. Which I have to have sweetened. That is my beverage weakness. When someone once described soda (or pop as we call it here in Canada) as a 'liquid candy bar', I stopped drinking it except for special occasions. Folks - aspartame is poison! Chemically just like wood alcohol. It never would have made it to the market except for some political shenanigans by Donald Rumsfield and Ronald Reagan. Read up on its history. I used to exist solely on soda for drinking. No tea, milk, juice...just Pepsi. About 2 years ago I switched to diet, hoping to drop some lbs. Didn't lose a pound. Last year I switched to water ONLY. I haven't had even a sip of soda since June of '09!! With a few other lifestyle changes I have lost 37 lbs & kept it off!! If I can do it anyone can.. & sooo worth it!! I tried to eliminate all diet/artificially sweetened drinks over the past year. Occasionally, I drink a diet soda here or there due to a craving. Like clockwork, I always have *extreme* leg cramps that night. I never used to until after I stopped drinking diet soda and lost roughly 40 pounds. I do drink things with some splenda, but I keep that minimal. I don't even get those leg cramps when I know I didn't have enough fluids! Thanks so much for this thread. I've been slowly letting my Diet Coke consumption go waaaaay too high. Just started cutting back, and this motives me to cut back even further! ok i have been balancing reguylar and diet sodas, i do feel more bloated after drinking diet soda, but i feel lazy and unmotivated to exercise with regular. but i disagree about water, sure watered down juice and herbal iced tea is great, but more of our bodies water needs come from fruits and veggies like tomatoes!!! Aspartame built up in your system turns into formaldehyde. I can't stand diet sodas, that nasty sweet & low/aspartame taste is just disgusting to me! Once in a while if I eat out somewhere, I will order a regular coke.. but more often latey, I'm just asking for water. Saves calories and a couple of bucks to boot!